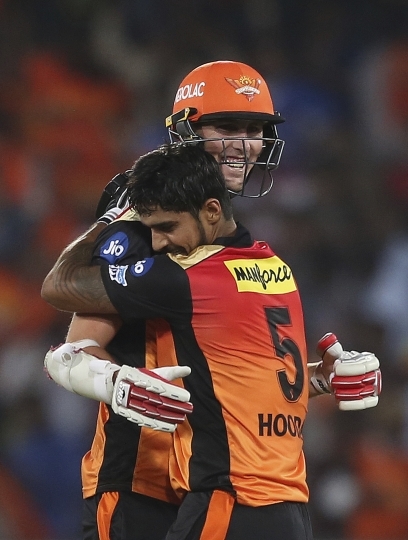 HYDERABAD, India — Deepak Hooda and Billy Stanlake held their nerve as Sunrisers Hyderabad won a thriller against Mumbai Indians by one wicket in the Indian Premier League on Thursday. Hooda made 32 not out off 25 balls while Stanlake scored two runs off the last delivery to clinch victory after leg-spinner Mayank Markande (4-23) and paceman Mustafizur Rahman (3-24) had earlier reduced Hyderabad to 107-5. 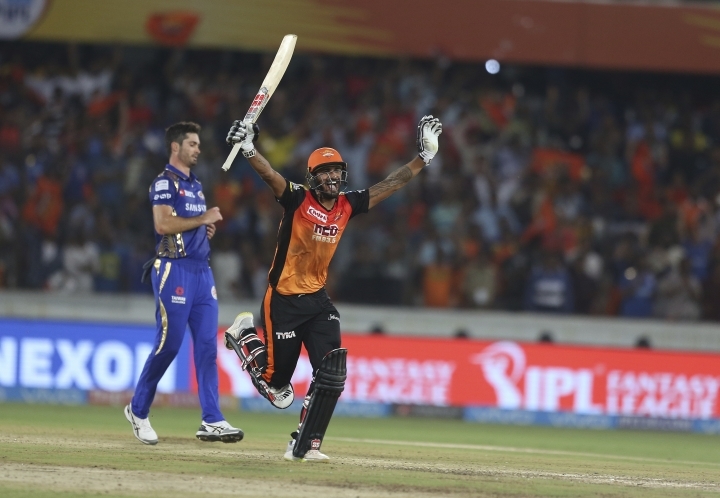 Chasing 148 to win, Shikhar Dhawan (45) and Wriddhiman Saha (22) gave the Sunrisers a fine start. Markande struck by removing both openers and Shakib Al Hasan (12), while Rahman had skipper Kane Williamson (6) caught behind. Hyderabad lost four wickets for 27 at one point but Hoode and Stanlake guided the team to a nail-biting win. "It was one of those games that comes down to the wire. At the halfway stage I thought it was going to be scrappy because the wicket was slowing up. The last ball can go either way so it was nice to win," said Williamson. Earlier, Mumbai was put into bat and finished with 147-8. They lost skipper Rohit Sharma early for 11. Evin Lewis (29) and Ishan Kishan put on 37 for the second wicket but Mumbai then slipped to 72-4. Suryakumar Yadav (28) and Kieron Pollard (28) staged a recovery before their team lost four wickets for 26 and were restricted to a sub-par total. Rashid Khan, who took 1-13 in four overs and bowled 18 dot deliveries, was named man-of-the-match as he helped Hyderabad go top of the standings. It was a second consecutive last-ball defeat for Mumbai. "It is still early days. Being on the receiving end for the second time is tough to digest. It wasn't a good enough total and our batsmen should have done better," said Sharma.